This page is dedicated to archival content for the International Arthurian Society's British Branch. To open the full-sized images click on the text beneath the thumbnail images. 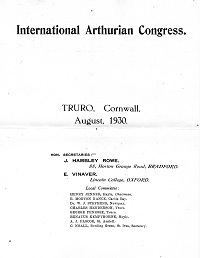 Professor C. B. Lewis attended the Congress, and made the list of participants given below. Others attending included Charles Henderson and W. J. Stein. Reports and reminiscences were published in BBIAS XXII (1970), XXV (1973) and XLIX (1997). Identification of the people shown in the photographs below was made principally by Mrs Vinaver, and has not been easy after so many years. 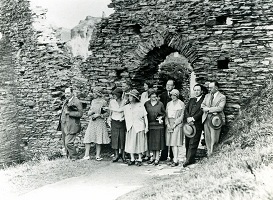 Second from left, R. S. Loomis, fourth from left Katharine Jenner, fifth from left Henry Jenner. 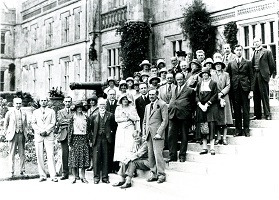 Mrs Vinaver wrote that “I think the young Dominica Legge is hiding under a cloche hat!” There are several wearers of such headgear, but I believe she is the one with glasses, smiling and peeping out behind the head of Eugène Vinaver, who is in a dark suit, directly behind the young man sitting on the steps. Second from left may be Mme Frappier, with Jean Frappier on the extreme right, and Eugène Vinaver next to him. These three can also be seen in the centre of the first photo, above. 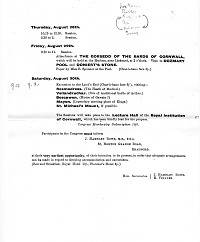 Page 1 of the programme. 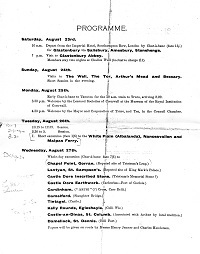 The copy of the original programme was kindly sent to Linda Gowans by the late Professor D. D. R. Owen, and came in turn from the papers of Professor Owen’s predecessor at St Andrews, Professor C. B. Lewis. Page 2 of the programme. Page 3 of the programme. 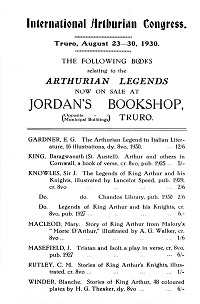 The copy photographs and advertisement for Jordan’s Bookshop, Truro, were kindly supplied to Linda Gowans by the late Mrs Elisabeth Vinaver.